A great deal of the following material was provided by the people at Mn/DOT, who appreciate the historical value of these parks and safeguard their historical records. A major resource is the Environmental Impact Statement (EIS) prepared by Mn/DOT in the 1990s. Black and white pictures were taken in 1939 and are courtesy of Mn/DOT. Color pictures were taken in 1999. 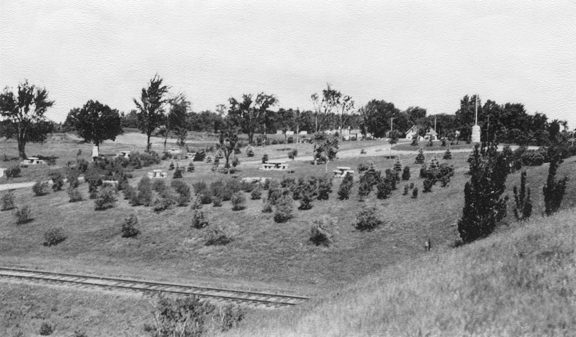 Blazer Park, also known as the Golden Valley Roadside Parking Area,was approximately 2.8 acres in size and was located on the west side of Highway 100 between Glenwood Avenue and Highway 55. Blazer Park was bordered by 100 on the north and east sides, Lilac Drive on the south, and Turners Crossroad on the west. Driveways entered the park from Lilac Drive and Turners Crossroad and converged on a parking area near the west side. 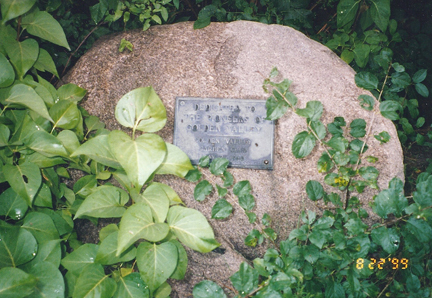 It was dedicated on May 28, 1939. 1. Limestone flagpole (with missing historical plaque) stands in the middle of a grassy oval at the center of the park. 2. Stone entrance sign. The stone pillar supported the hanging arm of the sign, hinted at by an iron chain hanging from the eastern side. The entrance was closed in 1968. 3. Stone picnic tables and benches. 5. 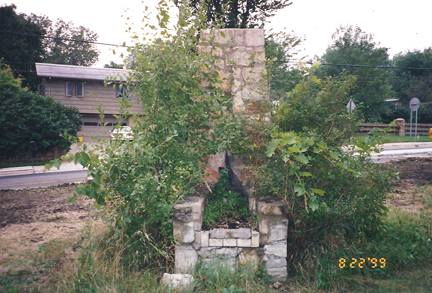 Stone fireplace with a prominent chimney. 6. Council ring near the center of the park. 9. Stone well with pump. 10. Circular island at the southern entrance – removed when Lilac Drive N. was put in. Although Blazer Park is less elaborately designed and less intact than Graeser Park in Robbinsdale, it retains a number of key design elements. The vegetation continues to reflect the original landscape design, which had a naturalistic layout that offered shade to visitors and buffered the picnic areas from the surrounding streets. 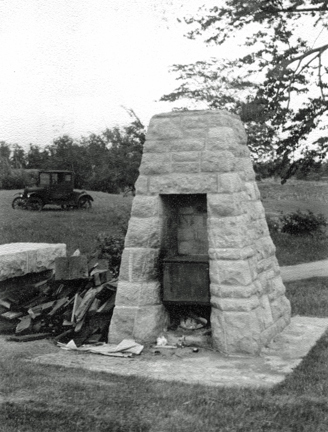 The park reflects the design concepts of the landscape architect Arthur Nichols, while also representing the work of the state’s WPA craftsmen, who often used native stone to fashion park buildings and other structures. Thus the park expresses environmentally sensitive, naturalistic designs, highlighted by indigenous vegetation and rustic limestone architecture. The City of Golden Valley does not identify Blazer Park as a park in its comprehensive land use plan. In general, the park has been neglected and receives minimal use because it does not provide specific recreational facilities. According to Golden Valley’s Park Superintendent, Blazer Park is, in fact, a source of resident complaints because of its condition. The city removed several deteriorated benches several years ago because of concerns that users could be injured. City-owned Yosemite Park is located 1-1/2 blocks west of Blazer Park and better serves nearby residents with playgrounds, ballfields, and other amenities. Access to Blazer Park is provided by foot or automobile. The entrances are on the south and northwest ends of the park (away from Highway 100). Lilac Drive crosses under 100 just south of the park and provides pedestrian access to the park from the east side of 100. Blazer Park has been totally removed by highway construction.